This dialog opens if an element, which links to the application's homepage or the page on which the element is located, is dragged from the workspace to the Elements area. The element and/or components of the control, for which a link destination has been defined, are listed here. Here, you can choose whether the link destination should be viewed as absolute or relative when the template is used - even in other applications. 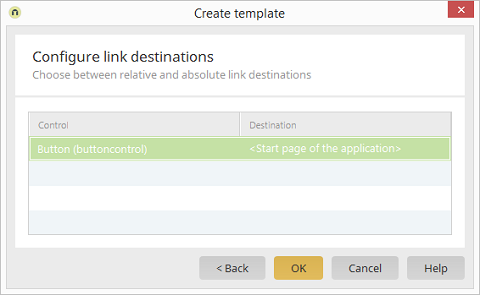 Absolute link destinations will always link to the homepage or page, on which the element is located, respectively, from the original application. Alternatively, the link destination can be defined relatively, this corresponds to the option "Start page of the application" or "Same page", respectively. This means that the element based on this template will open the corresponding homepage of the current application or the page of the application, where the element is located, respectively.